Obviously the oysters living in Humboldt Bay didn't vote in this category. They'd hardly call the Oyster Festival -- where 100,000 or more of their fellows get smothered in sauces and spice and chewed to death each year -- the best annual event. We'd hazard a guess that their best annual event is the moment they are dangled into the bay side by side and left sweetly alone to just hang there for months and months on end. Years, even. Tide in, tide out, tide in, tide out. So lovely. Ah, well. People like to eat them, and Humboldt Bay is the No. 1 producer of oysters in California. So bring on the festival! Fact is, it's a massive gathering of gluttonous and creative show-offs. Who can eat the most? Who can prepare them the best? So, oysters, get yourselves all tasty and prepare to meet thy maker again next June. Nearly 20,000 people are counting on you. 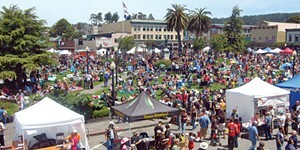 The Breakdown: Oysterfest 25%, Kinetic Sculpture 18.6%, North Country Fair 7%, Hops in Humboldt 4.3%, Humboldt County Fair 2.1%. Category popularity: Ninth.